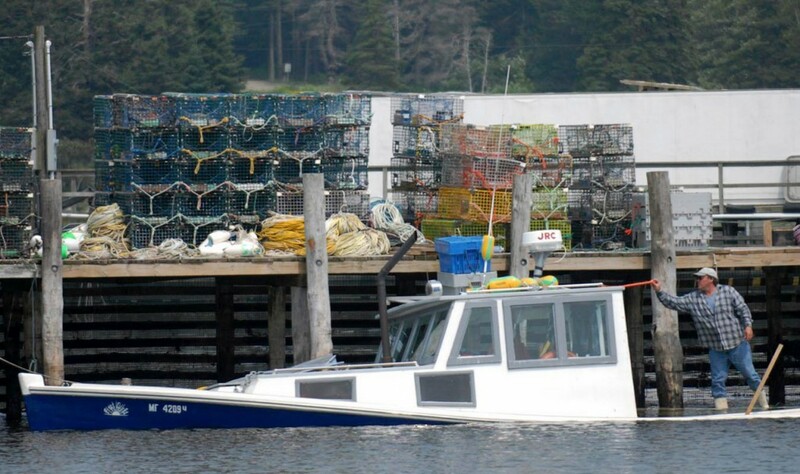 OWLS HEAD, Maine — Lobster territory disputes may have triggered the overnight vandalism Tuesday which left two lobster boats sunk and a third almost underwater, fishermen said — and the boat owners think that other lobstermen are responsible. At daybreak Wednesday, an early riser who came down to the pier noticed that the Miss Andrea, owned by McMahan’s uncle Richard McMahan, was listing badly at its mooring and that the Git R Dun and the First Light had sunk. The intake valves or hoses on the boats apparently were cut, officials said, which caused the boats to swamp within an hour or two. The vandalism did not appear to be connected to the recent lobster territory dispute on Matinicus Island which left one man in the hospital with a gunshot wound and another man arrested, said Maine Marine Patrol Sgt. Marlowe Sonksen. The Marine Patrol and the Knox County Sheriff’s Department will be working together on the investigation, he said. By Wednesday afternoon, the small fishing harbor bustled with people working to help McMahan and his son Ross McMahan start to flush out the boat and see what could be salvaged. At another pier, a group waited for the outgoing tide to pump out the swamped First Light, while the rescued Miss Andrea bobbed at its mooring. The air was heavy with a threatening thunderstorm, a Marine Patrol boat cruised the harbor and a Knox County Sheriff’s Deputy waited to examine the boats. Keith Simmonds of Owls Head, owner of the First Light, said this vandalism isn’t the first he has experienced this year. He said he has lost 200 of 240 traps in the past two weeks and has lost 1,100 traps over the past four seasons. “Usually, they don’t go after the boats. They go after gear. It has gone too far,” he said. Most of the local fishermen are “good people,” he said, and many helped him bring his boat back to the pier and start pumping it out. Simmonds, who is originally from Lubec but is in a long-term relationship with a woman from a local fishing family, said he thinks he is the reason the three boats were sunk. Someone doesn’t want him to fish in the area around Ash Point, he said, but he figures he’ll be able to get up and running again in a few days — even though the First Light was uninsured. 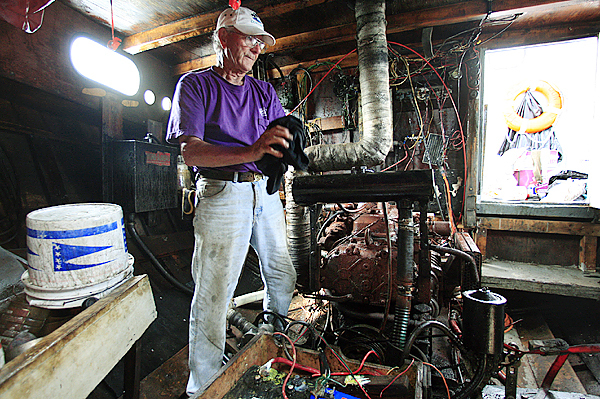 Those words were echoed by Donald McMahan, a lifelong lobsterman who suffered a stroke and an aneurysm two years ago and was determined to recover enough to return to lobstering. It’s a goal he reached just last month, said McMahan, 53, who walks with a cane. He also doesn’t have insurance on his boat. “I probably spent more time on the water than on the land,” he said, watching a steady stream of water pump out of the Git R Dun. His sister Deborah Damon of Owls Head said she hopes the sinking won’t set McMahan back in his recovery. Knox County sheriff’s Deputy Tim Carroll said each boat easily had thousands of dollars in damage. 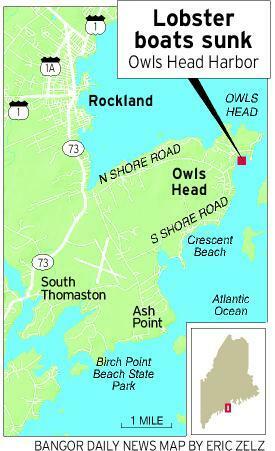 The U.S. Coast Guard was at the harbor early Wednesday morning in a 25-foot Defender Class response boat in response to an emergency-911 call reporting there were three vessels in Owls Head that were sinking. Dockworker Joe Ronco was another person who was at the scene early. Later, he stood back with harbor master Jeff Edwards and watched the harbor. 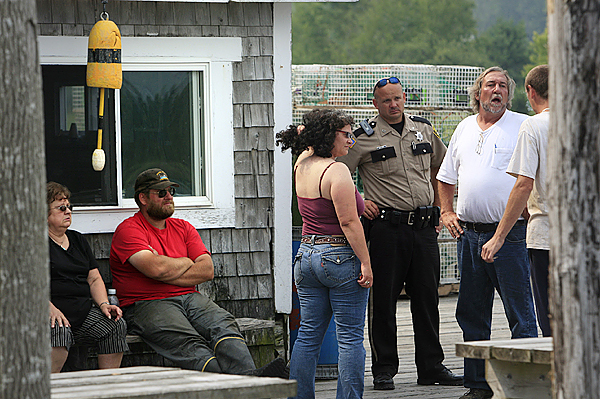 “There’s too many damn fishermen,” Ronco said. 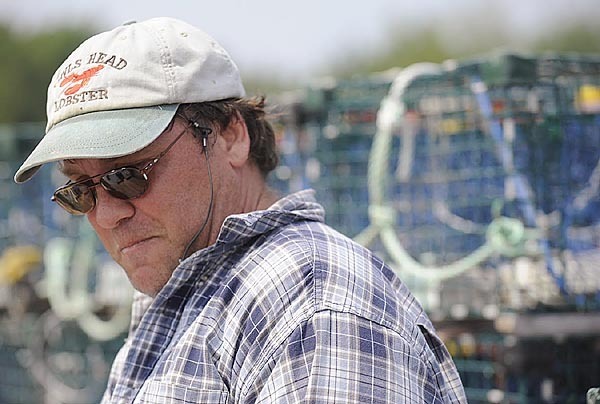 Edwards agreed, saying that when he started lobstering 15 years ago, there were half the fishermen and one-third the traps there are now.